Location: Carrick-on-Suir, County Tipperary, Ireland. 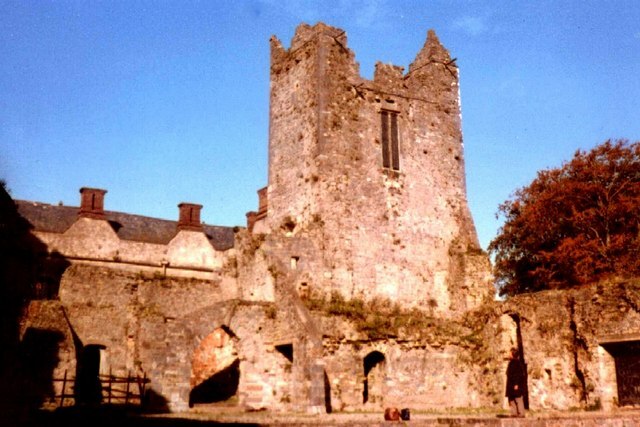 Notes: Ormond Castle is a castle on the River Suir on the east side of Carrick-on-Suir, County Tipperary, Ireland. The oldest part of the existing castle is a mid-15th century walled bawn, cornered on the northeast and northwest by towers. Built before 1315, the original castle was acquired that year by the Butler Family. James Butler would eventually be granted the title 1st Earl of Ormond. Sometime after 1565, Thomas Butler, 3rd Earl of Ormonde, (referred to sometimes as the 10th Earl of Ormonde) spent many years at the court of his cousin, through Anne Boleyn, Queen Elizabeth I. He carried from England a regard for Elizabethan-style architecture, and added a Tudor manor house to the property, the first of its kind in Ireland. In the 17th century the house was a favourite residence for James Butler, the 'Great Duke of Ormonde,' but the Butlers abandoned the home after James' death in 1688. The home remained a possession of the family until the middle of the 20th century. In 1947 the house was given over to state agencies who restored the historic structures. The manor house is enhanced by the mullioned windows on both floors to the front and the oriel windows of the porch in the centre of the facade. The gallery on the first floor features two carved stone chimney pieces and a ceiling and frieze of Elizabethan plaster-work. The U-shape of the manor house surrounds a small courtyard that abuts the north of the castle's bawn. The manor has two floors and a gabled attic. The most notable restoration achievement was that of the long gallery on the first floor of the facade, where the ceiling had largely collapsed. This room, once hung with tapestries, has a magnificent limestone fireplace bearing the date 1565, and has stucco representations of Queen Elizabeth flanked by Equity and Justice. It is said that she had promised her cousin that she would one day visit.